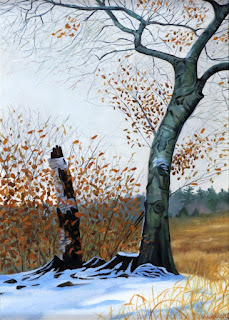 Phil Chadwick's Art: #0242 "Gray Day Beech"
An immature beech tree still clings to a few of its leaves in late January 1990. The tree was on Environment Canada property just south of the King City Radar site at the crest of the Oak Ridges Moraine. Radar needs to be sited on the highest point of land within the 200 kilometre radius that they scan. A similar sized birch was already dead leaving only a rotted four foot stump held together by the white birch bark. The farmer had trimmed the twin stems of both of these birches leaving only shallow stumps near the ground. The farmer new what he was doing. Trees prefer a single stem for each root system. White birch is also known as the paper birch or canoe birch. Betula papyrifera is a short lived tree surviving sometimes only thirty year. Trees in colder climates can last a hundred years and I presume that would include these tree and the white birch in the Mowat Cemetery. Climate change will mean that Ontario birches will typically not make it a century anymore. The birch symbolizes a beginning, renewal and youth. Both male and female birch trees flower. The flowers or catkins droop down on the male trees and sit upright on female trees. Birch tree produces fruit called "samara" which can release around one million seeds each year. Who knew? Both the yellow and white type of birch have a hardness of 4 on a scale of 1 to 5. Birch is readily available and less expensive than many other hardwoods. The tree of life symbolizes immortality and eternity, knowledge and wisdom, strength and protection, abundance and growth, forgiveness and salvation. In many tattoos, the tree of life is drawn with its roots and branches intertwined in a circle. I like to paint trees. I also painted these birch trees in #0239 "The Birch" and #0243 "January Birch".